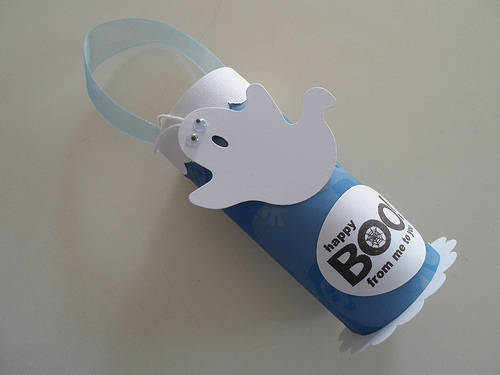 This cute little candy holder using a toilet tissue roll. This interesting card, made using a die that creates a two-sided pop-up feature. It was tricky photographing this one. Does the effect translate? 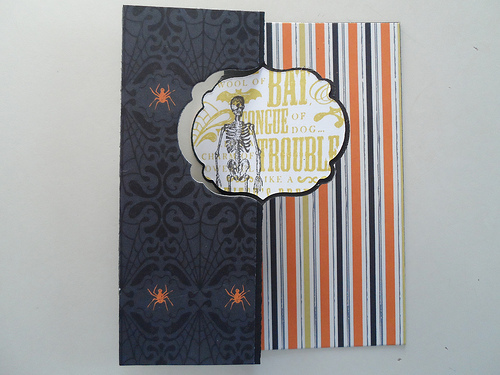 Finally, this cool Halloween card made using washi tape on the corner, a nifty skull button, and stamps with matching punches. There were even cool Halloween surprises. 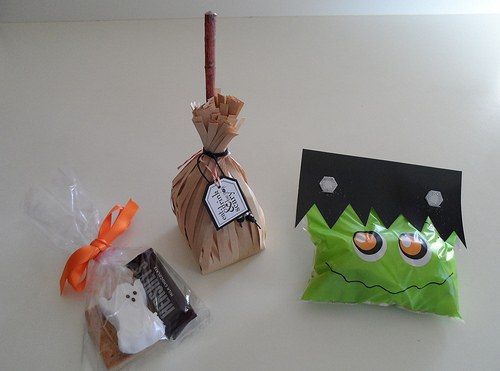 My friend made this adorable single-serve Halloween s’mores packet; my niece made this candy-filled witch’s broom; my sister made this Frankenstein packet filled with popcorn. A fun night, for sure. This entry was posted on Monday, October 21st, 2013 at 4:05 am	and is filed under In My Studio. You can follow any responses to this entry through the RSS 2.0 feed. You can leave a response, or trackback from your own site. 17 Responses to " In My Studio – October 21"
They are all great. Not long now till the fun big day. Have a marvellous Monday. 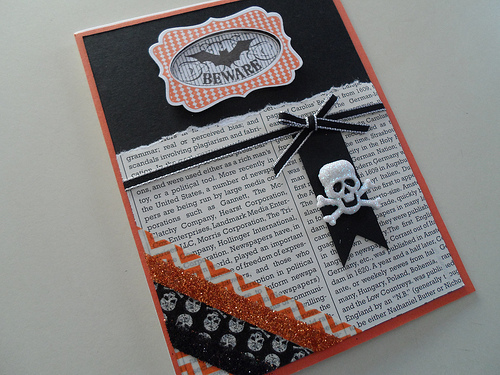 Fab Halloween goodies. I’d happily make some, but only ever had two boys round in all the years I’ve lived here. 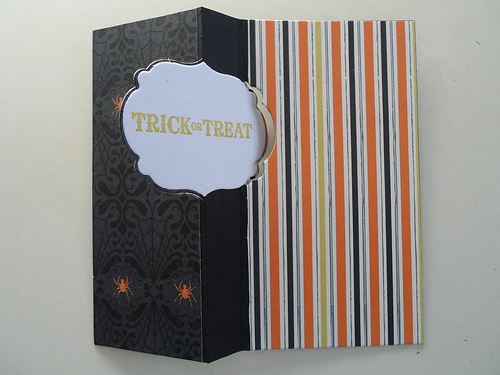 What great Halloween cards and treats, love them! Ohhhhh what pretty cards! Hand made are so special! You’ve been very industrious. They’re so cute. WOW you are so special!! What clever ideas! Our mom is not creative at all! Those are all cute! That paper roll at the top is pretty creative. Looks like a cute idea for party favors or something. All the things you made are incredibly cute. The “effect” did translate, and I liked it! I’d love to have the talent/skills that you have! What fun! Those cards are lovely and whoever is on the receiving end of them are lucky. I wish my friends had craft nights. Oh, I can almost taste that s’more! I can’t even come close to picking a favorite, they’re all so cute! you are so talented and they are all so adorable. Where did you learn to make cards like this!? That’s the fun thing about card club. My niece, who sells Stampin’ Up! products, has all the supplies together and shows us exactly how to put the cards together. All of these are so adorable! Your picture of the card did translate well…posts like this show me how much more I can be doing with my crafting…if only that pesky need for a job would keep from interfering! 😀 I may have to work out how to make that cute little ghostie at the top!